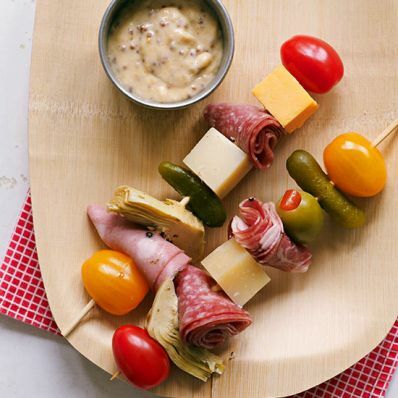 1 of 2 Thread skewers, alternating cheese cubes and rolled meat with olives, tomatoes, gherkins and artichokes in the order you prefer. 2 of 2 Combine mayonnaise, mustard and honey. Serve as a dipping sauce. Per Serving: 15 g Fat, total, 39 mg chol., 6 g sat. fat, 9 g carb., 1 g fiber, 10 g pro., 861 mg sodium, 211 kcal cal.